Master Email Address Finder is powerful bulk email software for extracting email addresses and sending email. 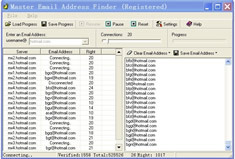 Master Email Address Finder is an email address harvester software can find email addresses and send email. 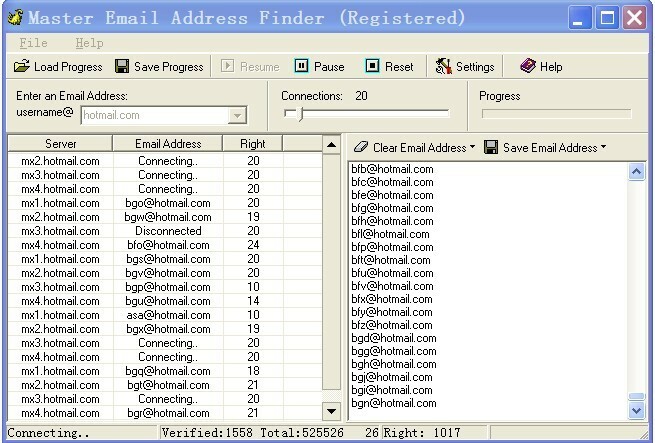 Master Email Address Finder finds e-mail addresses on targeted email servers. It can also send mail to all the e-mail addresses on that server. It can find and send up to 30000 e-mails, people can use it to broadcast their business. Safe! NO trouble with your ISP. Master Email Address Finder only verifies bulk email address via email server, Does NOT use the smtp(port 25) of your local ISP. Sends Bulk Email! Allows you send bulk email to every valid email address while searching. Easy to use! Just input an email address, and press the "Search" button. The program will start to search bulk email address and send bulk email. Fast! Supports multi-threads (multi connections to the email server). Intelligent! If the mail server interrupts the connection, Master Email Address Finder will reconnect to the email server automatically and continue searching. Extensive! Supports to export search result(email addresses) to Text, CSV, TSV and Microsoft Excel files. Order Master Email Address Finder NOW! Free Download Master Email Address Finder NOW! How to send bulk email with Master Email Address Finder?